Drawing was never any good for me unless I was not my usual self. I could never think my way through anything I did. What I wanted to do was readily available for me to see or feel beforehand or it was never there at all. It had to all be made up. I haven’t the skill or patience to work from life, to attempt to portray what I see in front of me. It’s about basic shapes and colors and maybe some music to help stir the pot within. Things are sort of spilled on the paper. There are plenty of mistakes. Nothing I do is ever really finished. 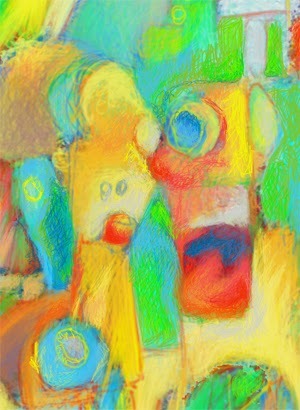 So long as a drawing is within reach it is susceptible to change. Sometimes they improve. Other times I disaster them. It can be depressing. Occasionally, I try to undisaster them. It’s been known to work but most of the time the result just further sinks beneath its awkward ways. There are so many false starts. I’ve created a field of debris. How good it feels when I’m happy with something I’ve done. Those moments are few. It’s like capturing a lightening bug in November when there aren’t supposed to be any lightening bugs flying about. Darkness settles in but a small light burns off and on within my jar. Basic colors have rewards. They each appear to have a distinct personality. One finding of interest to me is that a particular color may reveal a certain personality in one setting and then show a surprising different turn of character when placed in a wholly separate context. Let’s take a color of blue; one we might associate with a summer sky over the tumbling of surf upon sand. How this blue feels depends upon the company it keeps. Coupled with a sedate yellow I might find this blue giving me the scent of honeysuckle while on a first date. Were the same blue to cozy up against a brooding red then my pleasant blue becomes more willful. The light joy of walking hand in hand with faded ochre has now become more of an impassioned embrace. It’s serious business between these two, red and blue. I rarely listen to the words of a song. Images in my drawings often don’t count for much. They can merely be a starting point. A wheel is an approximation of a circle. A building is little more than a box. A path is a meandering line. They provide my excuse to record the path my mind plots through the movement of my hand. The forms must have meaning but I know not what. Should it matter to me? I think not. If you view a dance from some distance the impression left is that of the group. It’s the play of men and women together. Together they are the vessel that holds the charm. 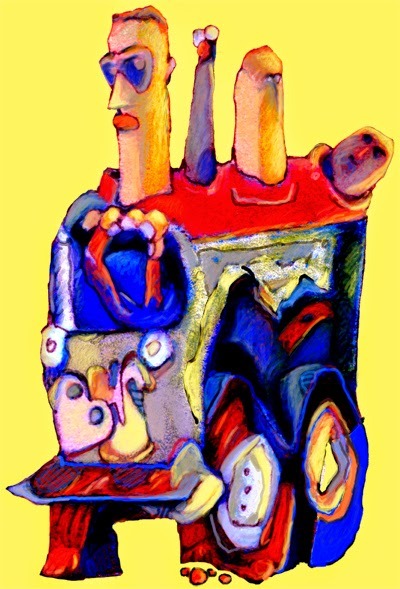 Ideally the various items in my drawing best serve the interest of making something whole. Have they come to dance? Can I see the music? A false note is like stubbing my toe. The melody is lost to the pain of stumbling over today’s misguided debris. What a colossal waste of time it has all been. What conceit. Trash. Still, later in the day I can hope. Tomorrow may be better. Length: 270.5 m / 888 ft. 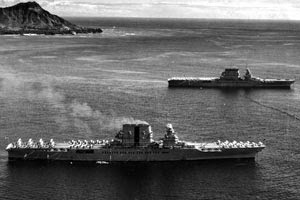 The USS Lexington (CV 2) and her sister ship the Saratoga (CV 3) were converted from battle cruiser to carrier while under construction because of a treaty resulting from the Washington Naval Conference of 1922. America’s first two real carriers came with hulls built to take a torpedo hit and a size that made it adaptable to aircraft that were rapidly evolving into larger size and weight. These long, sleek ships displaced over thirty thousand tons but their sixteen boilers and turbo-electric machinery made them surprisingly fast – capable of exceeding thirty-three knots if necessary. Their size enabled the concentration of a large air group that could be launched quickly for maximum striking power. 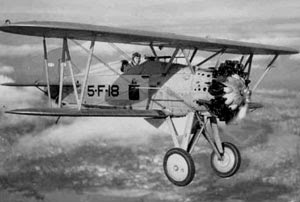 By 1929 fleet exercises made it evident that the carrier was a highly prized offensive platform despite the fact that its fleet of biplanes was not yet powerful enough to deliver a fatal punch. The Lexington and her sister ship were initially armed with eight inch guns, grouped in four turrets of two guns apiece. These were in line with the ship’s starboard island and its signature eighty foot stack that was constructed to disperse exhaust safely above flight operations on the deck below. 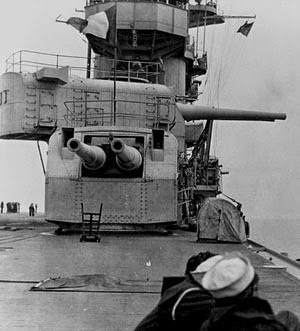 The guns were of such weight that they contributed to a slight permanent right list of the carrier, which could be offset by using fuel oil as counter-ballast. 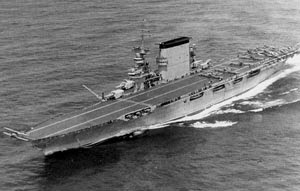 The initial thinking was the carrier would need this means of defending itself from enemy cruisers that might attack at night or in bad weather, for instance, when aircraft would be unable to launch. As carrier offensive doctrine developed, however, it became the rule that three heavy cruisers would combine with the carrier as a permanent tactical unit, providing her defense against conventional surface ships. In April, 1942 these guns were removed from the Lexington and replaced by weapons suited to protect the carrier from attacks from the air. It had become evident that the greatest threat to a carrier was aircraft from another carrier. Thus, the primary carrier role was to destroy the opposing carrier in order to prevent its own destruction. 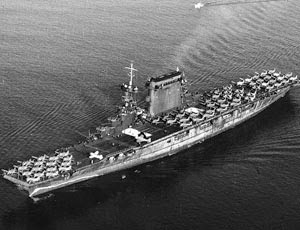 American doctrine held that the best carrier defense was a quick and powerful carrier offense. This view was shared by the Japanese. 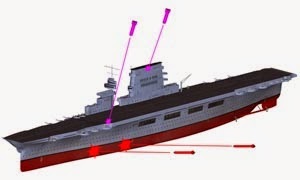 Both countries would forego the weight penalty of armored flight decks and build theirs using wood planks. This enabled them to pack more planes onboard to maximize their striking power. The rules of battleship conflict still applied, but at a much greater distance: victory goes to the side that first finds the enemy’s range and then pours down upon it maximum destructive force. Carriers needed to be quick on the draw. 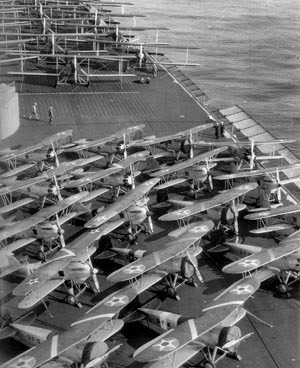 While Japan stored its planes in the hanger deck American doctrine had as many planes as possible parked on the flight deck, ready to launch. The problem was that the Japanese were able to group the air wings of multiple carriers into a single force and then effectively coordinate the attacks of her torpedo planes and dive bombers. 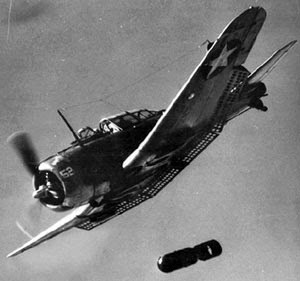 During the early portion of the war American carriers acted independently and their torpedo and dive bombing attacks were typically disorganized and piecemeal. 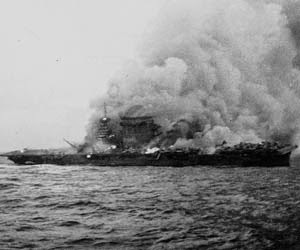 Despite this, the U.S. Navy was able to blunt the Imperial Navy’s thrust into the Coral Sea in their first carrier engagement despite the greater number of American ships sunk. The great loss for the United States in the battle of the Coral Sea was the sinking of the Lexington. Her deck was struck by two bombs but the greater damage was caused by two torpedo strikes on her port side. Still the Lexington was able to put out the fires and recover her airborne aircraft. The ship was even proceeding at a respectable twenty-five knots. It was shortly before one that afternoon when a devastating explosion, caused by igniting gas vapors, rocked the ship. The earlier forward-most torpedo strike had cracked the hold containing highly volatile aviation fuel. Two more explosions were to follow leaving the Lexington listing badly and consumed in smoke. The end came the evening of 8 May, 1942 following the removal of her remaining living members of the crew. 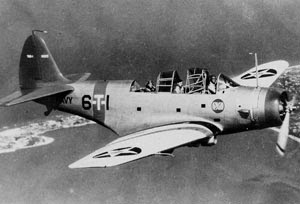 A carrier air group at the time of the Lexington was typically divided into four squadrons of about 18 aircraft each, in addition to several aircraft in reserve. 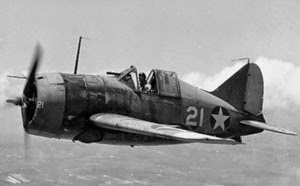 These squadrons would be broken into groups of fighters, torpedo planes, dive bombers and scout planes. 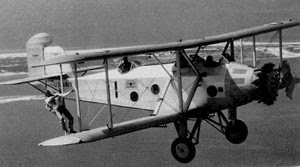 The scout planes would be the same as dive bombers except that they would carry an auxiliary tank for additional fuel in place of bombs. 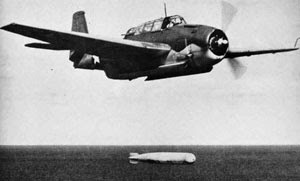 Torpedo planes could sometimes serve as a horizontal bomber by a change in ordinance. 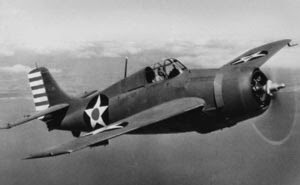 Fighter squadron sizes increased from 18 to 27 by the time of the battle of Midway. Carriers during the Guadalcanal campaign would have as many as 36 fighters on board, reflecting the importance of an active air defense. 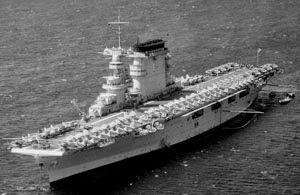 By late 1942 the U.S. Navy had lost the Lexington, Yorktown and Hornet, leaving the Enterprise as the lone fleet carrier left to fight in the southwest Pacific. It would be May of the following year before the first Essex class carriers steamed into the Pacific. It has been difficult putting my thoughts into words these past few weeks. Were I playing a piano I would say I’m feeling all thumbs. There aren’t any easily found reasons for the problem. I have a vague sense maybe I am in another of life’s transitions. We aren’t machines. We all have both intellectual and physical potentials that can be met on any given day but there aren’t any guarantees that we will achieve them. You see it demonstrated all the time in the performance of sports figures. A pitcher in baseball who throws a no-hitter has proven his potential but it is something he may achieve only once, possibly twice, in a career. It takes the convergence of a number of factors, like a perfect storm, to render such an outstanding positive performance. Our pitcher is likely to be at his physical best when he denies the batters of the opposing team a single base hit but he is also backed up by the errorless fielding of his teammates. Primarily, though, the pitcher’s state of mind has to be at the top of its game. I think this is the most difficult aspect to achieve. Extending one’s concentration, focused on one skill, over the space of hours is foremost a psychological accomplishment. The ultimate drama of golf is on the putting green where one’s physicality is almost irrelevant. Succeeding here requires the ability to ward off all the negative mental distractions that we associate with pressure. The same can be said of one kicking the winning field goal in the closing seconds of a football game. You may habitually kick successful field goals from twenty-five yards out during practice but when there’s only one second left on the clock and your team is down by two points and the fifty thousand fans packing the stadium are all relying on you… well, that’s pressure and all bets are off. You can’t afford to think which is why the opposing team invariably calls a time-out. You have been given the time needed to ponder all the possible things you might do wrong. You easily imagine the dreadful consequences of your failure to make three simple points with a routine kick. The ball veers wide right and everyone’s heart sinks. You let down your teammates. You’ve disgusted the fans. You choked. People can lose their job for this. How would you make your house payment as a washed-up ball player? Your wife and kids are depending on you to perform at a level you achieve with boring consistency. Simply kick the ball through a wide gap from only twenty-five yards out. Still the act requires a fluidity of motion. It’s like the shortstop throwing to first base to get the runner out. Your performance is best when you don’t give it a thought. Over the years you’ve practiced a thousand hours to develop what is termed muscle memory. It’s an act as unconscious as tying your shoes. Having to think about what it is you need to do while you are in the act of doing it is courting disaster. The ball sails high over the first baseman’s outstretched glove. The six foot putt misses the cup. The field goal is squibbed off the helmet of an onrushing lineman. The corruption of our confidence has resulted in the very disaster we most feared. Here is the ruination potential of pressure. The one characteristic shared by people that succeed to the top rung of their profession is the psychological strength to not crumble under pressure. The best of the best most likely thrive in pressure situations. The high stakes of the moment actually inspires them to more effectively focus on what it is they need to do. In fact, people with this psychology are most likely to flub something of apparent small consequence. The failure here is not due to encroaching fear of failing but of simple inattention. We are not machines. The very human qualities that make us extraordinary work against our ability to perform at top flight levels with a day-in, day-out consistency. Were it otherwise we would all be deprived of the entertainment value of suspense and drama. Field goals would never be missed and no one would show up for the game. Lettuce never is as it should be when I wish the green of its brightest look. The colors in beach sand and summer sky are best discovered when easily misplaced upon the contours of one’s disheveled face. No words elicit the mystery woven within a variation in blue. Four quarters delivers a cheek to cheek portrait of two rendered in a tight black booth. Here then are the wedding guests from the picture Mariachis. 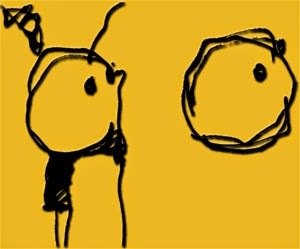 Sometimes drawing a picture has no conscious purpose. Doodling is too absent-minded to be what it is I am talking about here. I’m thinking about other things while I doodle. The kind of drawing I’m referring to requires my full attention but it doesn’t start with any apparent theme or have any desired conclusion in mind while I draw. I start with a shape. It suggests to me something I have seen in life so I elaborate on the original shape to create something that often appears cartoonish in its exaggerated simplicity. The item created usually brings to mind another item for me to associate with it. I am building a composition of images gathered together through a process that may have some similarity with word association. The items drawn are usually very elementary in their appearance. A house may be little more than a box with a single window and a couple of lines representing a pointed roof. A person may be as fluid as a stake punched in the ground. The land about these simple figures can be very elaborate in design. This design contains within it a suggestion of forms that individually and as a group hold no clear identity. It is a pattern of line and shadow that does provide an illusion of dimension but no reality works quite like this. There is often a sense of movement. It is not so much fluid as it is crumbling, ripped and tortured, like the slippage between layers of dissimilar sediments in an earthquake. Are those gaping holes in the terrain? Everything made by man attempts to root in what is inherently unstable. The earth is up and the sky is down. What is the sense of it? I haven’t a clue. Maybe it is nothing more than a junk dump of the mind. I never learned how to draw so my struggles with it contributed largely to my style. Accidents and missteps were all part of the picture. There wasn’t much to see that depicted a plan. 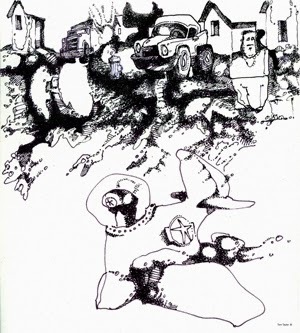 I enjoyed drawing because images from life were only the starting point. Drawing for me was a refuge. I wasn’t looking for a discipline. My picture world was about assembling geometric shapes. I could do rough squares, circles and triangles. Then I gave them features suggesting something like a face or maybe a tire. It was the pleasure of exploring trifles. It was fun. Everything one draws starts with an emotion. 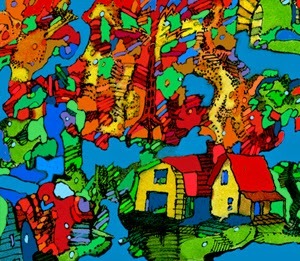 The quality of a line reveals one’s state of mind as their hand delivers color to paper. The thought behind a cleanly etched thin line is nothing like the impulse that strokes something rough, thick and textured. The same holds true with one’s choice in colors. Some colors provide resting points while others stridently demand your attention. Drawing that mirrors one’s interior world is like penning music to the page. Reason is lost to all those rhythms and blues. Art of any description settles into the complexity of one’s own feeling. Emotions can be powerful and nuanced, together. It is an expression not fully described. You can’t spell it out for me. I am moved by something that has no obvious source. It isn’t the tumult of specific everyday experience. I am for the moment filled with an appreciation that may have forever eluded me save for a sense captured in the gesture of another. I’ve somehow briefly become simply more than myself. Art involves a resonance from one to another of something beyond direct human fathom. It dallies with the curious mystery that is beauty. My words are useless. It’s just better to draw.